If you read travel blogs or articles, I’m sure you’ve been inundated with pieces on how to travel for free using frequent flyer miles. But, if you’ve never used flyer miles before, it can be a confusing venture. If you don’t fly frequently, you may think it’s not worth your time to sign up for miles. After all, there’s no way you could earn a free flight without jetting all over the world, right? Think again. Flyer miles aren’t a catch-22 like needing money to make money. There happen to be a plethora of ways that you can start earning miles today (with both feet on solid ground) by following our advice below. Points opportunities are just about everywhere. Just don’t blame us if you find yourself suddenly addicted to earning miles! One quick word of advice: do research to find the best options for your traveling needs and then choose to sign up for just one or two reward programs; it can be difficult, if not impossible, to merge points with different programs for redemption if you sign up for more than a few. When used correctly, this is the quickest and easiest way to earn a free flight. Most major reward cards offer a significant sign-on bonus that is usually equivalent (or very close) to a free flight when you open an account. You must purchase a set amount (usually $3,000) within the first few months to earn the sign on bonus so always do your due diligence and read the fine print before signing anything. Even if you don’t qualify for the promotion, you can still rack up points quickly by using your rewards card for all of your purchases and then just paying the card off monthly. Most major cards earn 1 to 5 points per dollar spent depending on the category. So if you spend just $1000 a month on your card, you could have an extra 12,000-24,000 points by the end of the year! You’ll need to do a bit of research to find the best fit. The best cards are those that allow for flexible traveling and aren’t tied into just one airline, like the Chase Sapphire Plus. 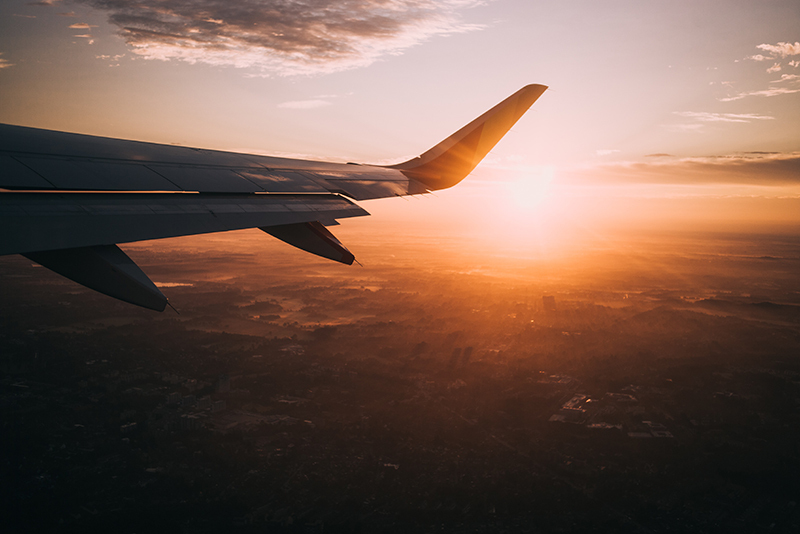 Earning frequent flyer miles doesn’t need to stop when your flight is over; you can earn miles throughout the entire traveling process. Most major rewards programs have rental car and hotel partnerships, as well. Check sites like PointsHound or RocketMiles before booking your hotel to compare what points can be earned among the hotels in the area. Rocket Miles also has promotions sometimes where you can score big points on particular hotels. Last year, Rocketmiles was running a promotion on a hotel in Ontario that scored us an extra 8,000 points. The hotel we had been considering would have only been a paltry 2000 points, and $50 more! So don’t book accommodations without checking what points you can earn first! And if you’re the type of person that likes to dine out a lot on vacation, (or even at home,) you can earn big points by not even doing anything out of the ordinary! Most major airline loyalty programs (like United and American Airlines) offer points if you eat at restaurants that are in their network. You simply log in to your loyalty account and link your credit card. Then when you eat at one of their partner restaurants using that linked card, you get credited your extra miles without even having to lift a finger. And, if you join Rewards Network, you can start earning 5 points per dollar spent after your 12th restaurant visit, which can add up very quickly. This is one of the easiest (and most satisfying) ways to earn miles! Chances are good that in this day and age, you do a decent amount of online shopping. Before you hit the purchase button, pop over to Evreward. You can search through thousands of affiliated merchants and get a listing of possible rewards that you can earn for your purchase (sometimes up to 10 points per dollar!) Then just click through to the site using EVReward and log-in to your rewards account to earn points on the purchase you were going to make anyway! If that’s too many steps, you can always log in to your rewards account directly and shop via the home page. And if you’re not set on a store, say you just need some new clothing, check out Cashback Monitor to see a listing of stores and their respective rewards so you can earn the most for your purchase.